uuid : 47ce3ec7-7a9f-4c98-96db-6b5a90043345 templates_id: 119470 templates_uuid: "0a0ec8ad-c29b-4ec0-a545-39f2fa08eb3b" title: "Share certificate template | Stock certificate" display_name: "Share certificate" meta_keywords: "Share certificate - Share certificate template - Stock certificate" description: "
A share certificate (also called a stock certificate) is proof that the person named is a member of your company and holds the shares in your company, as stated on the certificate. A company must issue share certificates for its shareholders within two months of its formation or the date of a new share issue or transfer. An issue of shares only becomes binding on a new shareholder when the company notifies them with this stock certificate.
" created_timestamp: "2018-10-08 04:36:10.0" modified_timestamp: "2018-10-08 04:36:10.0" active: true created_by: 102 modified_by: 102 dcm_id: 346 url_slug: "Share-certificate" meta_description: "Use this share certificate template to provide proof of title to shareholders. This stock certificate sets out the details of the shareholder and shares held." time_to_complete: "10 minutes"
More than just a Share certificate template, our step-by-step interview and guidance makes it easy to create your document. Easily create online, download, print and sign your free Share certificate in minutes. 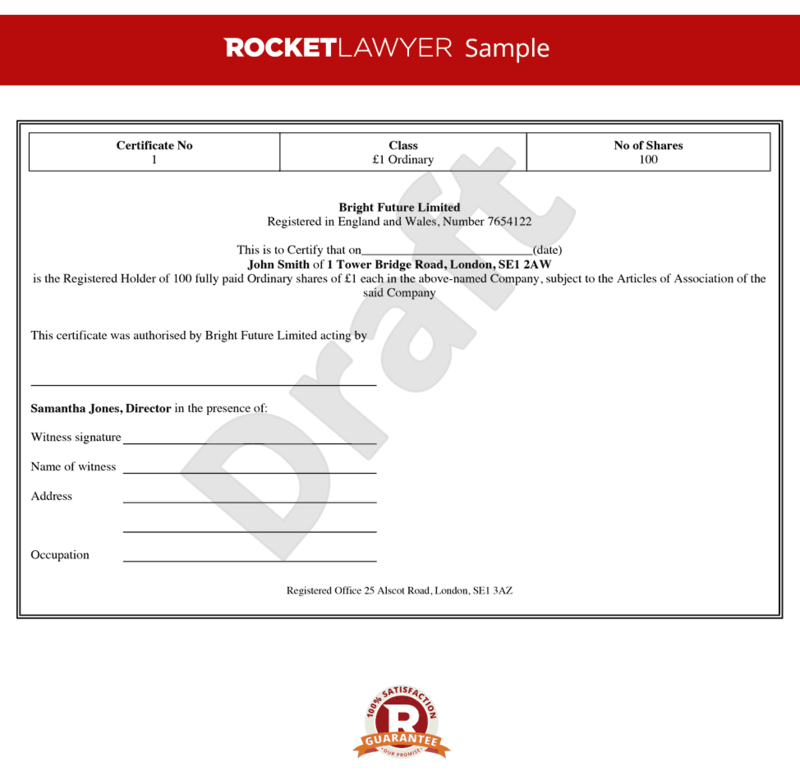 This document is also sometimes called: Share certificate - Share certificate template - Stock certificate.